And best of all - we colored while listening to stories on our iPads. Lilah has been listening to Cragbridge Hall, Book 2: The Avatar Battle and I was listening to The Elite (Book 2 of The Selection series). The Cragbridge Hall books are very exciting - a bit like Harry Potter... in the future... but with technology instead of magic. And time travel! The Selection series (the fourth book comes out in May! Eeeeee!) - is a cross between The Princess Diaries and The Hunger Games. Seriously. 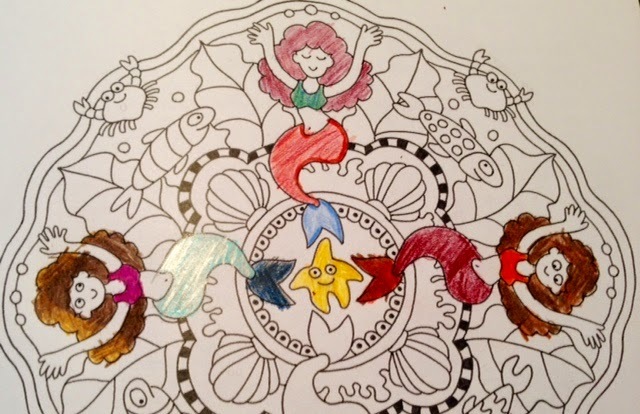 And what were we coloring for hours on end? 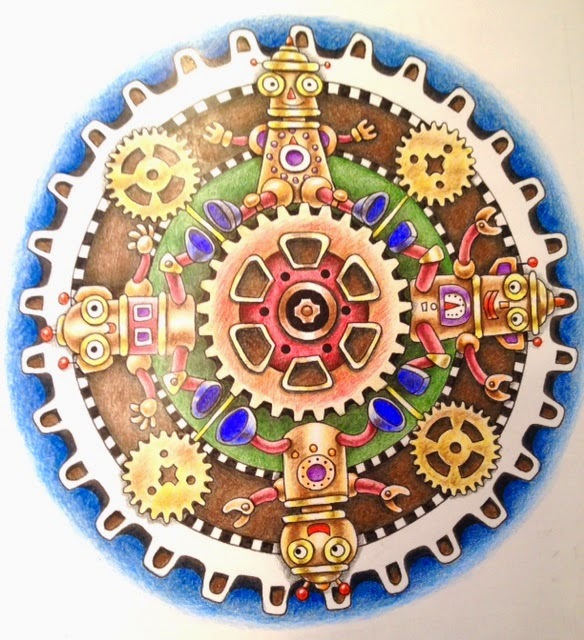 Judith Moffat sent us TWO copies of her NEW coloring book! 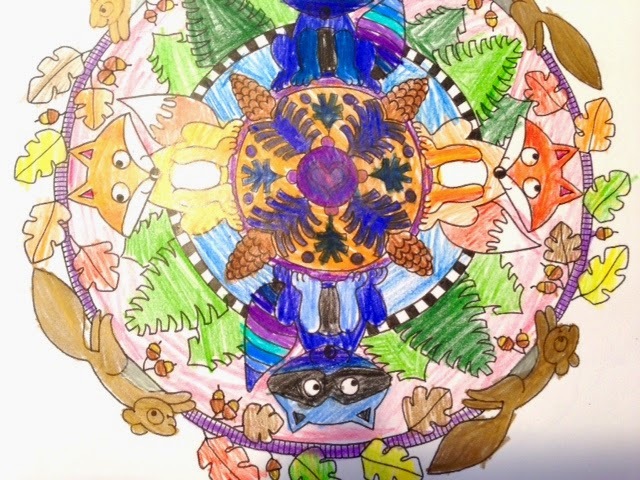 She knew that Lilah and I tended to fight over who could color which mandala and ended up making photocopies - so we each got our own coloring book. For a review of the first book, see my blog post from last summer. The first book was very detailed and geared more towards an older audience. Although Lilah and I both adored it. 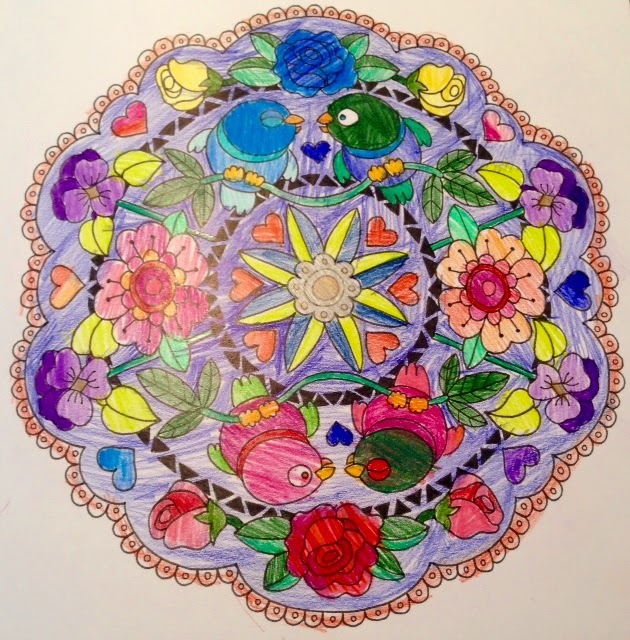 This second book, has simpler shapes and is easier to color - no matter what age or skill you are at. And the characters are so charming! 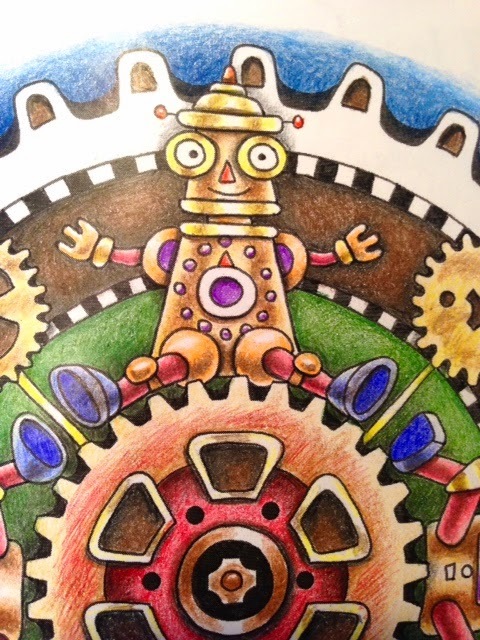 You might notice that we decided to go with (Prismacolor) colored pencils this time. Last time we also used markers which bled through the paper. If you prefer markers, either make a photocopy, or put a protecting sheet between the pages. The pencils are easier to blend too and these open shapes leave more space for blending, shiny areas and rusty spots. 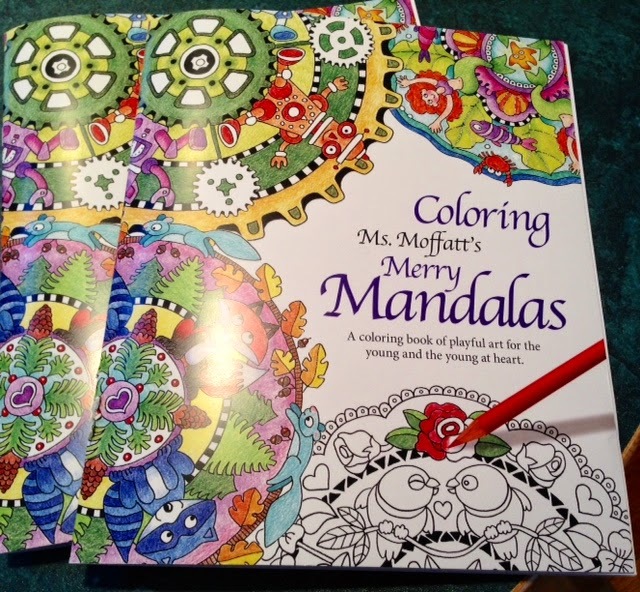 You can get your own copies of the mandala coloring books on Judith's Etsy shop. Oh, dear, I'd say, "Both!" Way back in November I got a very cool illustration assignment to work on a kids' book for ABCMouse.com. If you have kids, you'll want to check them out - they do online and print books. My project involved kids and swimming. A cute story with adorable characters. There were lots of revisions to the sketches over a few months, then all of a sudden WHOOSH -finishes due in three days! Yowza! Since this is a work-for-hire project, I don't own the right to show my artwork - which is fine since this project is helping to fund my cartoon school tuition. But, as usual, my little art director was working along side me and I have her artwork to show you. 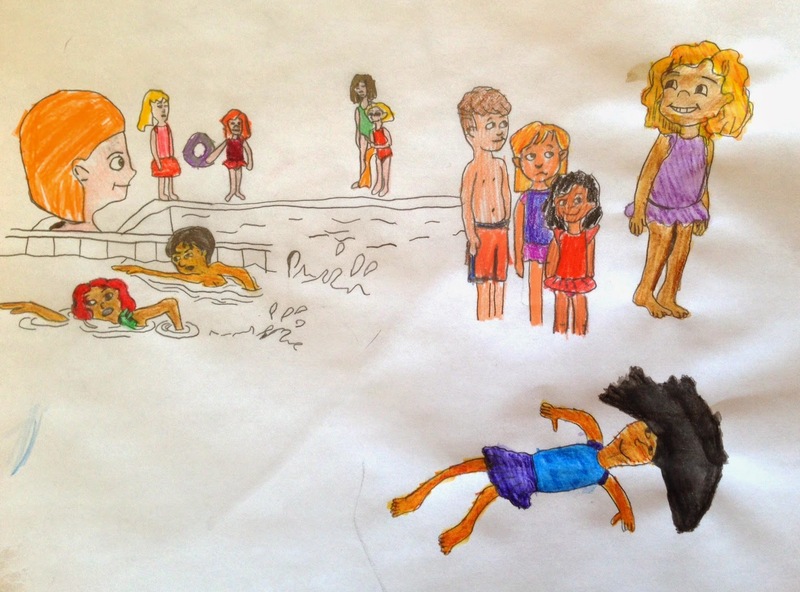 Lilah redrew a bunch of my sketches and then colored them as she saw fit. Her drawings don't bear much resemblance to mine, so I think my contract remains unviolated. 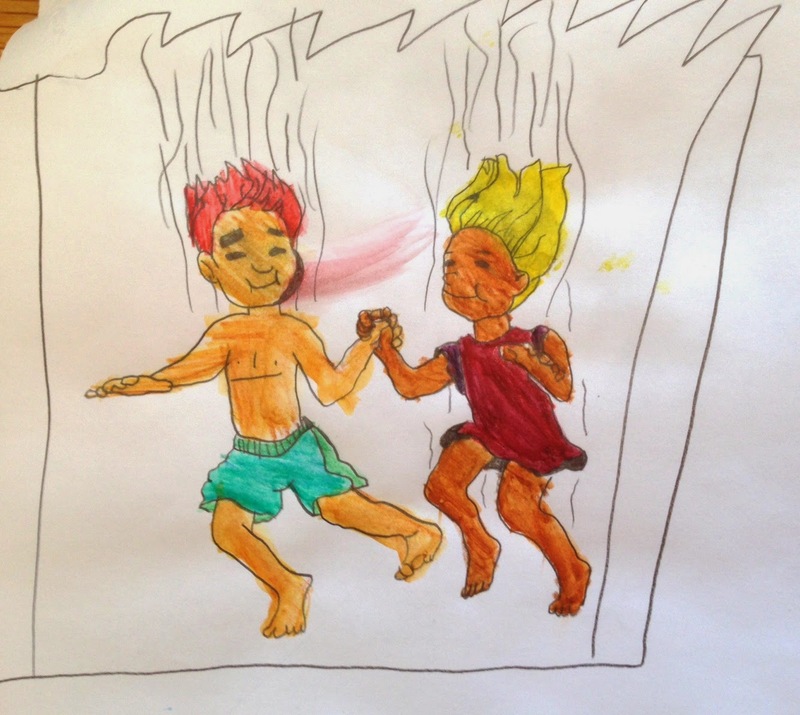 My favorite drawing is of the little girl with black hair floating in the water - at the bottom of the drawing below. She looks so happy and relaxed. That is exactly how it feels to float in a pool. Sigh. I can't help seeing all that white on the page as snow - very realistic right now. Brr. I'm not so fond of advertising or doing plugs for companies - even if I actually use their products. I DO like to share about things that get me excited - like women who are making a fuss. A positive fuss. They stand up, speak out and risk becoming a target. I've been following Vani Hari's food blog, FoodBabe.com, for about a year. The Food Babe makes a huge fuss - and she gets results. She's the Sherlock Holmes of food and she gets attacked - not just by the big companies, but by ordinary people who somehow feel threatened by her discoveries. Food is a very personal thing. Vani recently came out with a book that pulls together her ideas and research from her website and puts it all into an easily "digestible" plan. It's not a typical diet book - although the cover text may sound that way. She's not just talking about eating less sugar, but eating less freaky chemicals - like yoga mat foam and silly putty. Eeeewww! Learning that creepy stuff is in Subway sandwiches... which I used to think of as "healthy" alternatives to McD's... seriously puts me off my lunch. 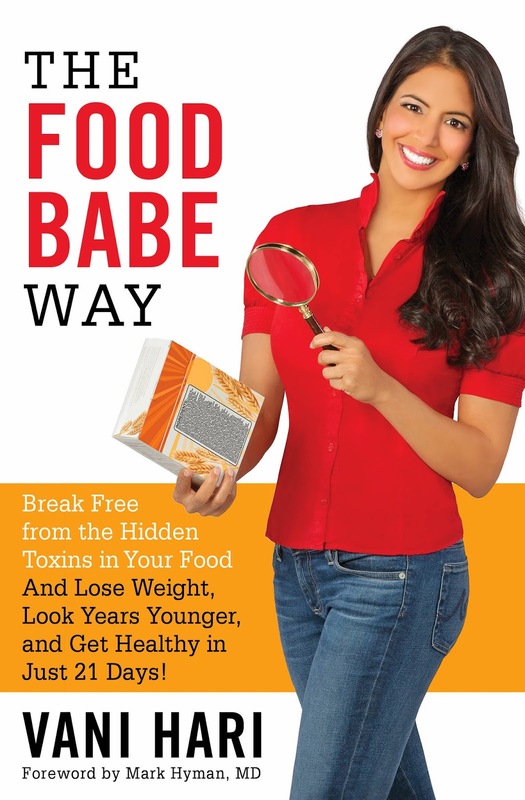 But the Food Babe isn't just in this for the freak-out factor, she lays it all out for you, and she suggests alternatives, lots of action ideas - if you like to take action - and hope. Really, things CAN improve. If you are more of a quiet action person, like me, don't get overwhelmed or offended by the Food Babe Army concept. It takes very strong people who are willing to speak up and keep attacking (verbally) in order to get real changes made in the industry. Start where you are. I'm not at the petition or boycott level, but I can still make a difference. I like having the information so I can make changes in my own life and refrigerator. For example, we eat Annie's Mac and Cheese, not Kraft. I pre-ordered my copy on Amazon, a few months ago, when Vani first announced it. She also sent me a free copy so I could review it. I'm going to donate the second copy to my local library. 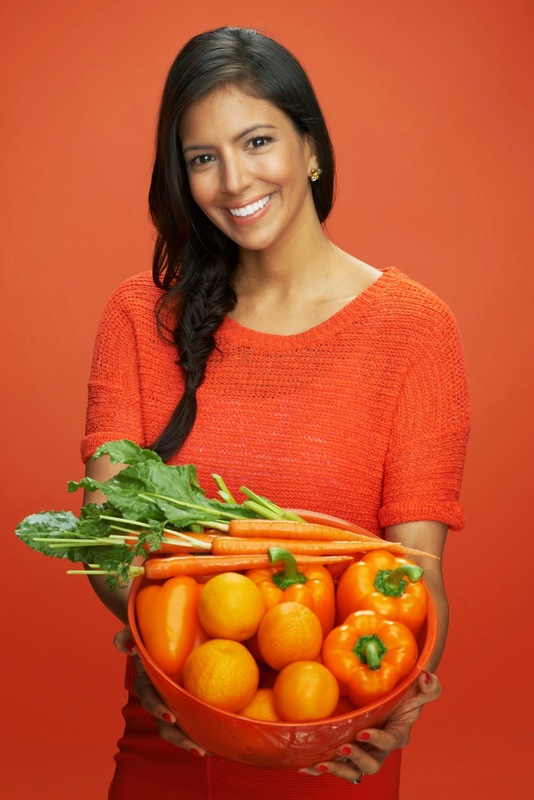 The Food Babe is drop dead gorgeous. I admit to feeling skeptical when she describes what she looked like "Before." How could someone who looks like this, ever have been anything but fabulous? Take a look at the link for the trailer below. It shows a few pictures of what Vani looked like on her All-American diet of fast food and junk food. That face and body look nothing like the Food Babe in the pictures above. Things got so bad that I was allergic to the allergy shots! I had to walk with a cane because of severe pain and arthritis caused by a deformed hip bone (from the radiation). I suffered through eight sinus infections in a row one winter. When my daughter was born, I had strep followed by a second case of mono. If I went out in public... I got sick. It's very hard to be creative when you are miserable. I read a book called Potatoes Not Prozac: Solutions for Sugar Sensitivity and despite a total lack of support from the medical community, I watched a miracle happen as I weaned myself off of my major sugar addiction. You wouldn't believe all the changes that occurred, but if you have met me in person, you will notice that I don't use a cane - and I can hula hoop! I'm not on any medications and haven't suffered from serious depression in years. I am still 20 pounds overweight and have some trouble sleeping, but nothing like insomnia anymore. Seeing the Food Babe's book gets me so excited - if I could witness so many positive changes in my life - just from cutting back on sugar - what could I do if I got some of those other chemicals out of my system?! If that sort of thing gets you jumping for joy too, you'll want to read this book. If you are tired of pouring a rainbow of chemicals into your kids, you will want to read this book. If you just want a clear list of what is safe to eat - and then get on with your life - you will also want to read The Food Babe Way! Well, the second step, after Applying, would be Getting In…. I can't even begin to tell you how excited I am. And terrified. Going back to school… have I mentioned it has been a really long time…? With all the crazy stuff going on right now - financial aid forms, a really big illustration assignment (kids' book!) 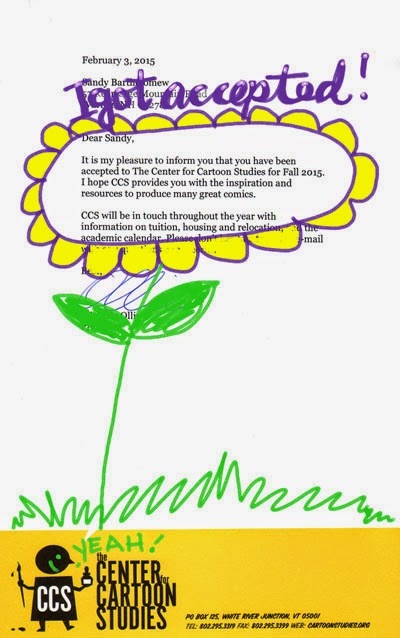 with a deadline next week, the kids' stuff… anyway… I have to remember to actually CELEBRATE this major achievement!?! I want sushi. And a movie. I have a really bad habit of throwing the water (my attention) wherever the major fires are. As soon as one thing is checked off the list - I'm on to the next - without even a pat on the back. • Applied for a property tax abatement. I now know everything about my own and all my neighbors' property taxes. • Gathered and brought all my tax info to my accountant. • Filed financial aid forms for my son's colleges. • Had an interview for cartoon school. • Redrew 20+ pages for the kids' book project. • Painted 5 pages out of 20+ pages (all due next week). And shared my drafting table with my little art director who wanted to learn to use the lightbox and Inktense pencils - so we each had about a foot of space to work in. There's a funny story there too - another time. • Applied for ISBN numbers for my ebooks and self-published books so I can list them on Amazon. • Worked out with my wii every day this week. • Took the new cat to the vet. Then had a family meeting to vote the cat off the island. :-( Also a good story. Actually, that one might be a comic book. • And a hundred other things. Point is - I'm not just sitting around eating bon-bons and watching the soaps. It's important not to see everything as just another item on a To-Do List. This is my Life. Some of the items sucked, some were exciting - but all of them taught me something new. I think that would qualify them all as "Experiences." When I was working on my cartoon school application, I had to draw a comic that included myself, a robot, a piece of fruit and a snowman (?!). I also had to write an essay and all the other usual stuff. Since this is graduate school - I had to include a CV. A list of my Experiences. The last time I had updated mine was in 2008 so I made myself nuts trying to figure out what I had done in the past 7 years. I eventually went through all my blog posts to recreate my life in list form. I felt like a cat with so many different "lives". Sometime I will have to share the CV here on the blog - and the rest of the comics too. At the very least it will help anyone who has been following this cartoon school story and has been thinking "Cartoon school?! Where is this coming from!?" 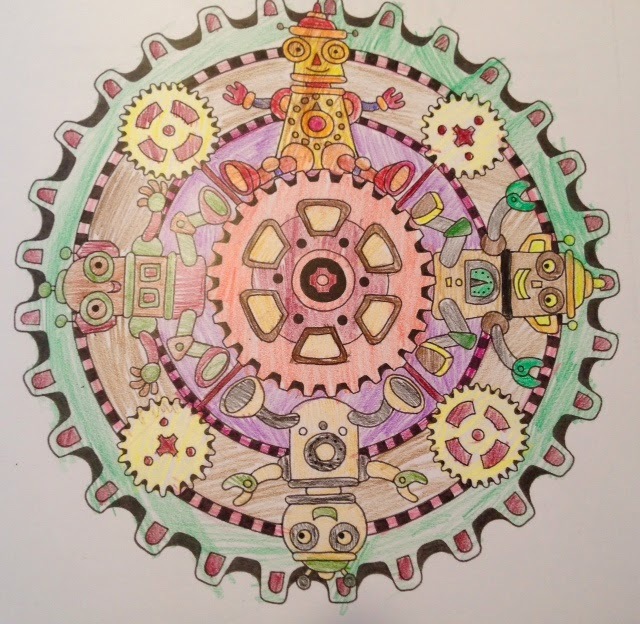 Way back before Zentangle. Before blogging. Before kids. Before marriage. Before Egyptology and photography… I drew cartoons and dreamt of animation and writing and illustrating children's books. At the risk of sounding philosophical… sometimes you need to have your world come crashing down to see what it is built upon. And one more time - "WoooHOOO! I got accepted!!!" To celebrate the one year anniversary of the Tangle Library App, Ian (the developer) and I are hosting a special one day sale on February 4th. If you are new to my blog and never heard about the App, or you are feeling nostalgic, here's the link to the post from one year ago. This one also explains why it is for i-gadgets and not for Android. Sorry Android folks. For non-techies, you can get the Tangle Card decks at my Etsy store. So don't forget, Tangle Library App Sale on February 4th, ends (Feb. 5th).